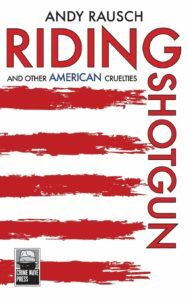 I’m delighted to be taking part in the blog tour for ‘Riding Shotgun and Other American Cruelties’ by Andy Rausch. This collection of three very different but all equally gritty and gripping noir stories makes for exciting but thoughtful reading. The intriguing title immediately piques the reader’s curiosity, and the cover certainly catches the eye. As the title implies, there’s a Western theme to this book and we meet a selection of outlaws, both criminal and social, dating from the 1930s to the present day. Our first, in the first story ‘Easy Peezy’, is Emmet Dalton, one-time bank robber now author. Reading in the newspapers about current bank jobs going on tempts him back into his old lifestyle, if only to show these youngsters a thing or two. So he recruits two sidekicks who, like himself, aren’t in the first flush of youth, and thus the Old Timers Gang comes into being. That’s not the name Emmet has chosen for his gang but it’s the one the public have settled on, to his extreme annoyance. Melvin Purvis, FBI agent, is also something of an annoyance too. ‘Riding Shotgun’, the second story, sees Joe Gibson, mystery writer, finds himself in a truly nightmare scenario where he is forced into taking actions he really doesn’t want to take in order to save the life of his kidnapped daughter. Despite keeping his side of the agreement, Emily is not released and this drives him further into the depths. He teams up with an assortment of unsavoury characters to track her down and gain revenge at the same time. Mertis Whitlock is the cop relentlessly on his trail. This is a bitter-sweet story, very grey morally as who of us wouldn’t take extreme actions to save their own child. ‘$crilla’ (scrilla is a slang term for money) is more of a romp, but no less destructive. Charlie Grimes, ex-cop with a roving eye, finds himself trying to solve the kidnapping of Davis Cartwright, a record producer specialising in promoting gangsta rap stars. Some of these turn out to be true gangsters, and another complex and riveting tale of revenge, deception and misunderstandings ensues. These are all no-hold-barred stories. Many of the characters are amoral and dangerous, with hair-trigger tempers. Some are just plain dumb. Others are thoughtful, deeper, more complex but just as tough. What emerges clearly from all three stories is how situations can rapidly spiral out of control, how unintended actions have disastrous consequences. The pointlessness of violence is illuminated too. What have the deaths achieved, other than some personal satisfaction for the killer, but not even always that. There’s a truly tragi-comic face-off between two characters in one of the stories: they’re as aware their actions are as futile and life-wasting as the reader is. But it’s what they have to do. There’s redemption amongst the chaos and bloodshed. Our main characters are empathetic despite being deeply flawed. They’re likeable rogues, much as we might try to not be won over by them given the bad things they do. They’re capable of good, of recognising that what they do isn’t the right thing. The last words of one of our villains is “I’m sorry,” and he genuinely is, but, of course, it’s too late. Engaging and entertaining, with plenty of wry humour alongside the splashes of horror, this book shakes you up and makes you think. Excellent. RIDING SHOTGUN AND OTHER AMERICAN CRUELTIES is a unique collection of quirky, Tarantinoesque crime novellas, representing three very different sub-genres. In the first story, “Easy-Peezy,” a band of elderly Old West bank robbers return to their wicked ways robbing banks in the 1930s John Dillinger era. The second story, “Riding Shotgun,” is a bitter tale about a man pushed to the limits of human endurance and forced to take up arms to protect those he loves. The third tale, “$crilla,” is an urban crime fantasy in which a fledgling hip-hop group kidnaps a record mogul in the hopes of finally making the kind of loot they’ve always dreamed of. Author Bio – Andy Rausch is a freelance film journalist, author, and celebrity interviewer. He has published more than twenty books on the subject of popular culture, including The Films of Martin Scorsese and Robert De Niro, Making Movies with Orson Welles (with Gary Graver), and The Cinematic Misadventures of Ed Wood (with Charles E. Pratt, Jr.). 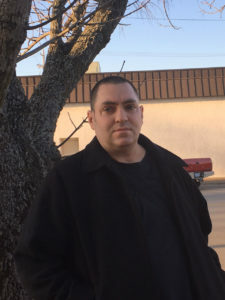 His work has appeared in Shock Cinema, both Screem and Scream magazines, Senses of Cinema, Diabolique, Creative Screenwriting, Film Threat, Bright Lights Film Journal, and Images: A Journal of Film and Popular Culture. He has written several works of fiction including Mad World, Elvis Presley: CIA Assassin, Riding Shotgun and Other American Cruelties, and the short story collection Death Rattles. He has also worked as a screenwriter, producer, and actor on numerous straight-to-video horror films. Posted in Book reviews, Fiction, Uncategorized. 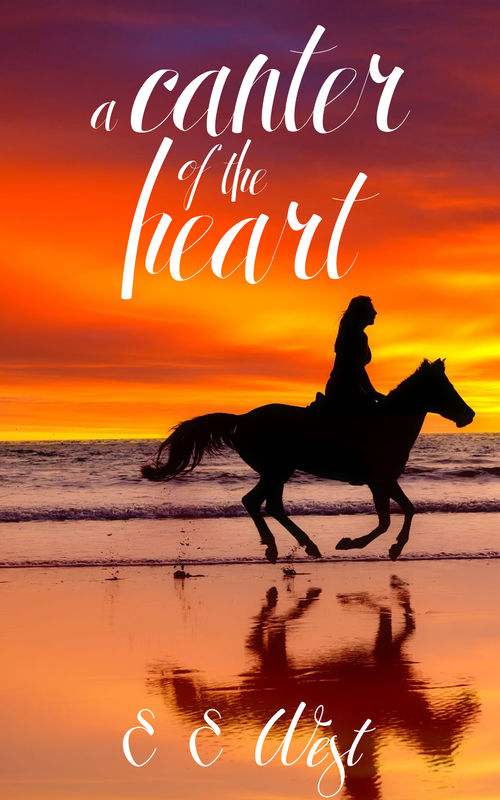 A Canter of the Heart by E E West describes itself as “a romance that will speak… to your heart” … and you know what, it really does! Twenty-year-old para-equestrian Eleanor lives on her parents’ farm in Boyanup and fills her time with schoolwork and riding, and girls’ outings with Annette and Carol. Eleanor is wonderfully positive and fun, the sort of person you’d love to have as your best friend. So it’s no surprise that American naval flight offer David is smitten when he bumps into her at a nightclub. They have just two days together in Australia before David has to go back to his ship. They’re determined that their relationship will last but everything seems to be forcing them apart – spiteful ex-girlfriends, missed phone calls, delayed letters, the prejudice Eleanor perpetually faces from certain qualities, even war. But the prospect of thirty-four magical days in America together keeps them going. Can their love last? Much as Eleanor adores her horses and her riding, it’s David she now needs to make her life complete. The story introduces us to two fascinating central characters. It takes us from Australia to America and back, with a quick visit to Singapore. The author captures the settings of each place beautifully and you think you’re there too. But what E E West portrays best of all is human emotion. Both Eleanor and David are on emotional rollercoasters after they meet, and we share their love for each other, their longing, their frustration, their irritation, but most of all, their irrepressible optimism and hope for the future. This is a wonderful story that warms as well as speaks to your heart. And the good news is that this is the first in a trilogy: The Equestrian and the Aviator. So more great writing to come from this talented author. Buy the book on Amazon here. Here’s an interesting non-fiction book. Like the last book I reviewed on this site, it’s aimed principally at the American market but is an extremely interesting read for people in other parts of the world. Every country seems to have had its financial crises lately, so finding out how this author proposes we can cope with such national financial mismanagement is enlightening. The author is Nicholas L Maze. 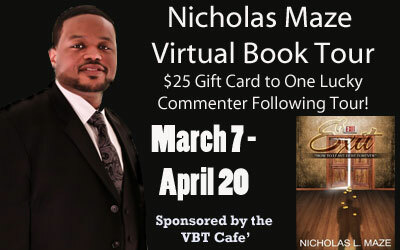 Born in Flint, Michigan, Nicholas got a degree in Business Administration at Baker College with a focus in Accounting and Marketing. Since he had a knack for advertising and excelled in maths, it looked like Nicholas would pursue a career in business. Howeve, he had another gift. A stint with a security organisaion in the summer of 1999 led to a rebirth of his passion for writing. As a child, he had written many stories. During composition courses at college, Nicholas realized that his gift was still intact and was praised by colleagues and instructors. Soon he was writing more and more. He started by writing poetry and composing songs. It was at this same time that Nicholas began managing a small rap group, which allowed him to hone his writing skills even more. He wrote songs for his rap group and for himself. In 2004, Nicholas began to write his first published work. To be successful, Nicholas made himself the reader. He put himself in the passenger seat and let his imagination go to work. As Nicholas was completing his book, he rediscovered his religious faith and also got a second job. Two jobs and attending college full-time forced him to put his writing on hold until he’d obtained his first degree in Marketing. At last he was able to focus on his unfinished work and he completed his book in 2007. He was unable to place it with a publisher and placed his book on the shelf and returned to school. In 2009, a prophecy about his writing gift prompted him tobegin pushing his again. “I instantly thought of my finished work and began sending out query letters. Within two months, I received a publishing deal.” Now, Nicholas is fine-tuning himself for a long, successful career as an author – his first love. What 12+ years of schooling never provided is located within this amazing literature. From basic instructions on saving to the reason for America’s current financial dilemma, we receive great advice in the world of finance. People across the globe are crying for relief that will never come. 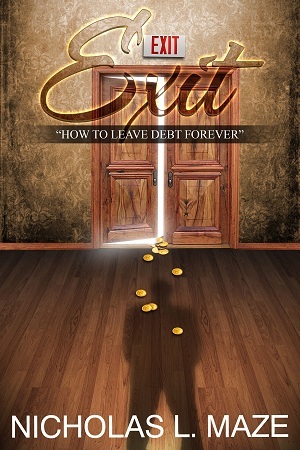 In Exit, we learn that financial strain is planned and orchestrated. The more America suffers financially, the more successful certain individuals become. How do we eliminate a problem that has been in place for almost 100 years? We first learn how to exit, escape. As I was driving down the street one day, I became conscious of the world’s condition. Contrary to what you would think, it wasn’t the abandon houses I drove by; it wasn’t the cracked pavement, or homeless people that seem to be in unison. It was the children. God gave me the understanding that a child is nothing but an adult that is trapped. In their minds, they live in an orchestrated fantasy world. Their world is orchestrated by other children that have aged over time and learned to be adults. The older children (adults) determine what the younger children wear, eat, and drink. And for the most part, a child is okay with the control. For most children, it is all they know. They live in a mental fantasy world, because their knowledge is limited. Limited knowledge brings forth the purpose of school. A school should strengthen a child’s mind, because one day that child will have control of other children and he/she should be mentally prepared and able to take on that task. This is what separates a child from an adult, knowledge. And, this is also what hinders are society…knowledge. Knowledge is the key ingredient in this book. My main goal is to educate many and erase the “get rich quick” mentality. The term get rich quick was created for those that lacked knowledge, because they knew that without intelligence, an individual would fall for anything. Getting rich quick is a scheme. And, if I sell you a book that is nothing but a scheme, I have not only cheated you out your money, but I have also helped you go deeper in debt.